Driving the Ford F-150 Raptor, it’s all too easy to exhaust one’s cache of superlatives. It’s an immense truck, standing about as tall as the average NBA player at 6 feet, 6.5 inches, and broad enough to require a pair of amber corner markers at each end, near the headlamps and taillights. It’s also immensely potent, its get-up-and-go furnished by a 3.5-liter V6 with a pair of turbochargers, and as much as 450 horsepower and 510 lb-ft on tap. And of course, it’s immensely capable off-road, being damped by a set of mammoth, 3-inch-diameter Fox Racing Shox with up to 14 inches of travel at the rear. That should all be obvious enough from the spec sheet, but here’s something that mightn’t be: the 2018 Ford F-150 Raptor is somehow, astonishingly luxurious. Granted, it lacks all the usual call signs of a luxury vehicle – a premium wood veneer, supple materials over every exposed square inch, and the sort of well-weighted, tactilely rewarding switchgear that might be found in the king’s personal pickup truck, for instance. But like all of Ford’s aluminum-bodied passenger vehicles, the cabin is damn near as quiet as a cathedral (save for tire noise – a necessary trade-off for its high-performance BFGoodrich off-road tires), and its desert-racing-bred suspension soaks up bumps with tremendous aplomb. That’s what we learned from a week behind the wheel of Ford’s rapacious, well-sprung bird of prey, after the automaker was kind enough to lend us one for evaluation. Detroit’s pothole-ridden roads are the stuff of legend, but so is the F-150 Raptor, and we’re happy to report that we were able to return the truck in proper nick, with nothing bent or broken. Our F-150 Raptor was a SuperCab example with a downsized second row and a tasteful shade of gray paint that Ford has named “Lead Foot”. It was graced with Equipment Group 802A: a $9,770 option that includes heated and cooled driver and front passenger seats with 10-way power adjustability, leather seating surfaces, an 8-inch SYNC 3 screen, premium B&O PLAY audio, heated steering wheel, LED box lights, and some other goodies. Perhaps the most important part of the 802A Group, though, is the 4.10 front axle with a Torsen differential. Torsen is a portmanteau of “torque” and “sensing”, and in essence, the word denotes a complicated sort of limited-slip differential that uses worm gears to redistribute torque to whichever wheel can best use it. In plain speech, what that means is improved traction and better stability in slippery conditions. Figure in the optional tailgate step, spray-in bedliner, and other odds and ends fitted to our truck, and you’re looking at roughly a $70k price tag – a good deal more than the $50,675 MSRP for a barebones SuperCab model. Keep that in mind as you take in our thoughts on what it’s like to drive. Coming from primarily driving cars in the compact-to-midsize range, climbing aboard the 2018 Ford F-150 Raptor requires a huge cognitive leap. It’s simply taller, broader, and longer than nearly any other non-commercial vehicle on the road, so that every maneuver on a packed interstate or a narrow city street requires the utmost care. Driving through a typical parking garage induces a whole new type of anxiety; the radio antenna likes to ping off of every clearance sign and low-hanging beam, so that you’re just waiting for the roof to catch with a horrifying screech. Granted, folks coming out of full-size SUVs likely won’t have as much trouble adjusting. Plus, the F-150 Raptor does plenty to help make its size manageable, like offering a reverse sensing system, 360-degree camera, and Blind Spot Information System (BLIS) with Cross-Traffic Alert. Visibility is more than apt, thanks to a tall driver position, and the bottom cutouts on the front windows help the driver to see smaller vehicles and pedestrians that might otherwise be obscured by the belt line. Once you’re able to quell any anxiety relating to the Raptor’s immensity, it becomes a surprisingly comfortable, relaxing place to be. It seems somehow strange for such a military-grade piece of hardware to coddle its occupants, but as we’ve said, the cabin is whisper quiet, and the ride silky smooth. The creature comforts installed on our tester contributed still more to the truck’s astonishing pleasantness, delivering above-par comfort and a stellar music-listening experience on the road. For the driver, the peace is disrupted by just two things: the Raptor’s all-terrain tires, and the ten-speed automatic transmission. The tires, we’ve been told, were crafted specially for the Ford F-150 Raptor, with the aim of providing the best of two worlds: on-road usability, and off-road capability. But of course, those are two very different goals, and trade-offs had to be made. The end result is a tire that not only produces a fair amount of noise on the pavement, but that nibbles incessantly at the wheel as the rubber blocks compress and deflect. 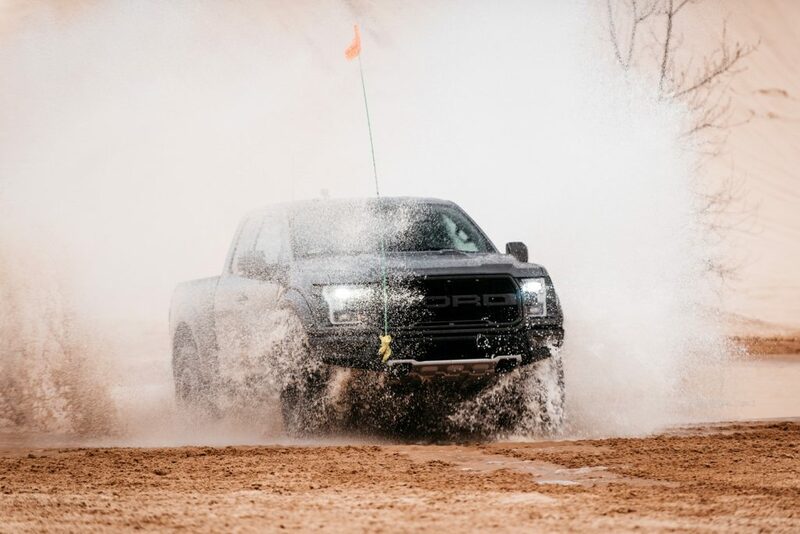 As for the transmission, it has two speeds too many, and try as they might to craft optimized shift schedules for each of the Raptor’s different drive modes, Ford’s engineers haven’t quite nailed it. Perhaps it’s something that can’t be nailed. Taking off from a stop in Normal mode, you’re never quite sure how much torque you’re going to get, as the difference between holding first and promptly upshifting into a higher gear can feel like a couple of millimeters of throttle position. 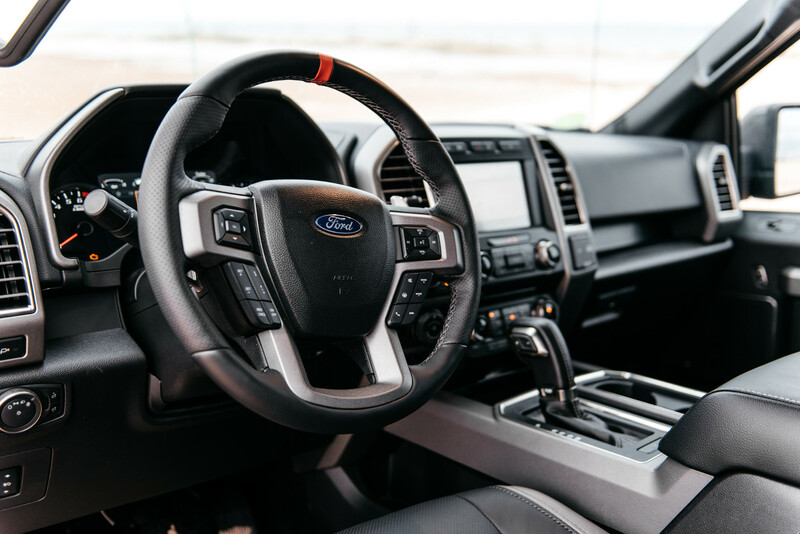 Once you’re rolling, the hunt is on for the right gear; until you’re settled into a steady cruising speed, Ford’s ten-speed auto never seems to stop searching. Thankfully, with normal, light throttle application, shifts are smooth enough to be nearly imperceptible; it’s only under heavy throttle that you really notice the unit’s indecisiveness. Some of the Raptor’s transmission quirks are cured by switching into Sport, but that mode has a tendency of hanging onto gears quite a bit longer than anyone would want on the street. Take your foot completely off the throttle to prompt an upshift and still it hesitates, holding the revs for what feels like an eternity before finally changing up. There’s a set of wheel-mounted paddle shifters for manual control, but you’d be better off without them; ten gears is far more than any mere mortal can be reasonably expected to keep track of, and since the paddles move with the wheel, around even a gentle corner, you’re never quite sure at a glance which paddle is which. For a vehicle whose wheel moves as much as the Raptor’s does, the paddles really ought to be mounted on the column. To be frank, it would be an absolute waste of an F-150 Raptor to only use it on the road. A symphony orchestra might as well hire Yo Yo Ma to punch tickets. Off-road is where the Raptor truly belongs, and it’s there that all its let’s-not-call-them-faults simply fade and disappear, giving way to an awesome beast capable of some truly mind-bending tricks. Yes, the 2018 Ford F-150 Raptor can be taken rock-crawling, although the drivetrain is far more well-equipped to deal with that usage case than the body is. Remember, this is a big truck; every tight turn and encroaching tree represents a challenge – not to mention a very real threat to the truck’s alloy body panels. 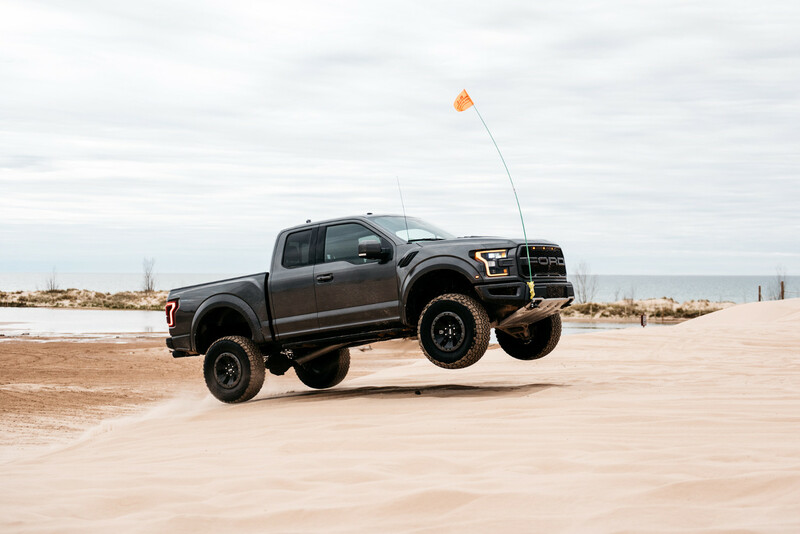 In fact, when we took the Raptor off-roading along the trails at Road America in Wisconsin, we ground the rock rails rambling up a rock formation with a particularly steep breakover, experiencing a loud, heart-stopping scraping noise that most off-roaders know only too well. Over that same formation, the smaller, nimbler Jeep Wrangler didn’t make a peep. Such scrapes always sound worse than they are, of course, but we hear that the Raptor’s rock rails might not be so easily replaced if they’re compromised. The real question is how the mammoth full-size pickup managed to make it up the formation at all. But it’s in sandy, dusty, high-speed off-road settings that the F-150 Raptor really thrives. With nothing better to do on a nippy May day, we took the aptly-named bruiser to the Silver Lake Sand Dunes in western Michigan. Our reward after a more-than-three-hour drive one way: a stupid amount of fun. 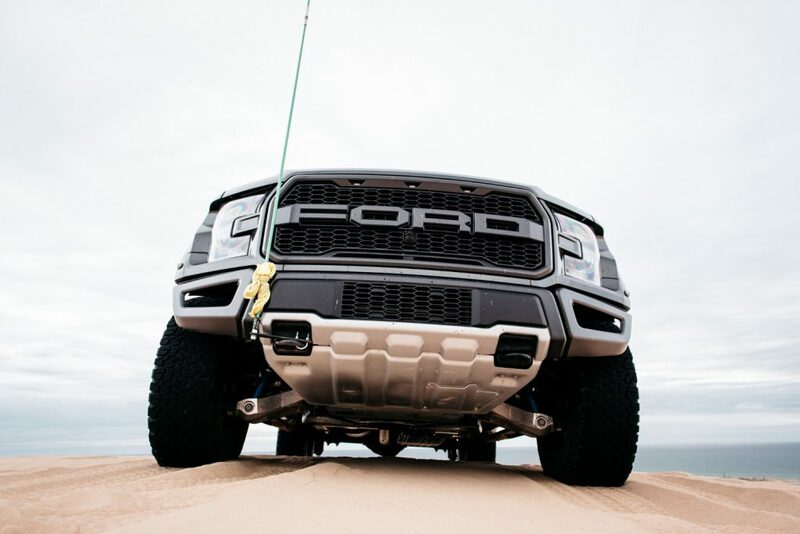 The same BFGoodrich All-Terrain T/A KO2 tires that seem so uncertain on the road more than earn their keep off of it, wrangling every little bit of traction that the loose sand has to offer, and channeling all 450 horses’ worth of power that the 3.5L EcoBoost can provide into the terrain. You don’t have to be Ken Block to do it, either; the F-150 Raptor is so user-friendly an instrument that an absolute novice could wield it. Just let some air out of the tires, set it to Baja mode, and let the truck sort out the rest. Bumps and jumps? The Raptor’s got them handled. The truck uses a different frame than your standard, run-of-the-mill F-150, making it especially well-suited to rough treatment. You’d have to do something positively stupid to break anything. 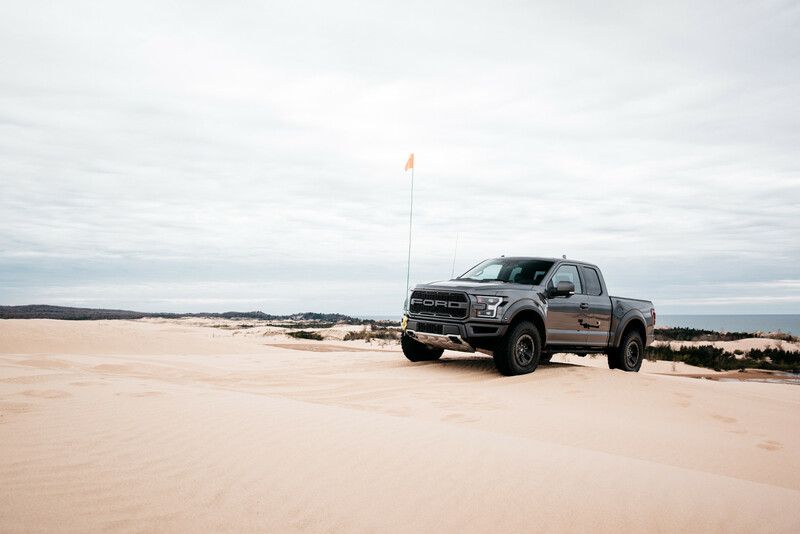 With nothing much to go awry, and the ten-speed automatic transmission left with relatively little to do, you’re free to devote your full attention to appreciating the F-150 Raptor’s stunning off-road prowess. And that’s what we did, climbing every dune, exploring every valley, and devouring every mogul until the gas tank grew light. If you can find the space to do it, sliding the truck around through wet sand is especially fun – just watch that you don’t get stuck. 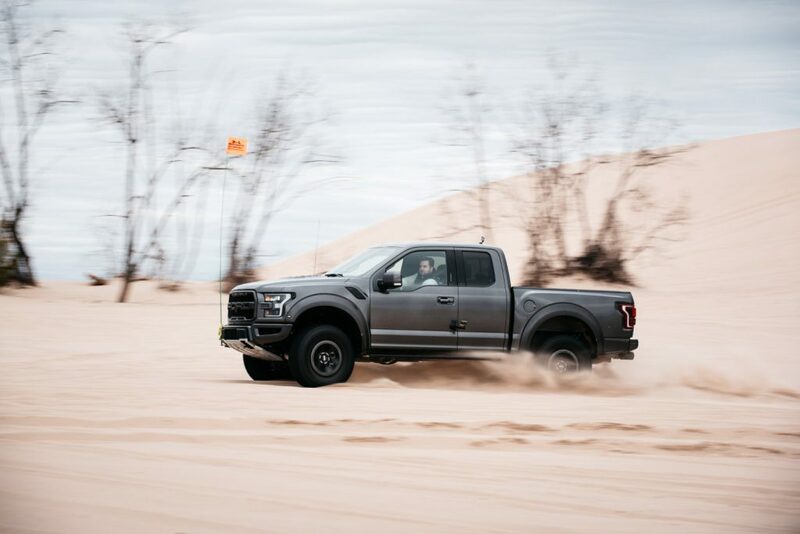 That the Raptor is adept at handling whatever loose, unpaved terrain you throw at it, whatever the speed, doesn’t come as a surprise; the truck’s very appeal – what makes it so irresistibly cool – is that it was specially built to dominate off road. Even still, actually experiencing firsthand what this weapons-grade hunk of steel, aluminum, and sheer bravado can accomplish in defiance of the laws of physics is a trip. Having seen – and felt – what all the 2018 Ford F-150 Raptor is capable of, one name in particular comes to mind: Jamal Hameedi. He’s the brilliant Ford Performance engineer who came up with the idea for the original SVT Raptor, pitching it as a sort of heavily-modified, high-performance desert racer that was available straight from the factory. Customers could save time and money by not having to turn to a performance shop to build a truck for them, and Ford could dip its toes into an entirely new segment. His recipe is just about perfect, but earlier this year, Hameedi left Ford, jumping ship to go to work for Jaguar Land Rover’s Special Vehicle Operations (SVO) unit. Yet gone though he may be, we suspect his way of thinking will have an impact for some time to come. The company in April announced a push to solidify its spot in the performance off-road-vehicle market in North America, introducing new products like the Bronco, a second, smaller off-road SUV, and a Raptor model of the all-new, North American Ranger pickup. Consumers’ fevered response to the Raptor is likely at least partly to thank. Will any of the resulting vehicles be quite as tantalizing and bedroom-poster-worthy as the Ford F-150 Raptor? We can only hope. Without getting aftermarket tuning shops involved, it’s about the most fun one can legally have on four wheels. I had the original SVO Skunkworks Ford LTD LX in 1984, a Mustang sourced 5 L V8 in a smaller LTD. II just remember a sway bar separating the two sump oil pan which I later, after a near disastrous oil change, discovered also had two drain plugs. My teen aged son held the school record for air time jumping a railroad crossing near Elburn, IL on the way to Kaneland H S at the expense of Sears Warranted shocks. That was probably the imputos of the demise of the Craftsman free replacement warranty on tools, auto parts, and Sears in general! Did you imply that your testing antics did no damage to the terrain as well as the truck? I observed a lot of tracks in the sand and torn-up dirt thrown around. Would hikers agree that a Raptor tearing around with knobbies kicking up dust and decibel levels exceeding a KISS concert does no harm? The cabin may be isolated from tire noise but the wildlife around ….not so much. Ford profits get a kick from the Raptor concept but the terrain you tore apart gets the shaft. Donald Trump in a Raptor, that’s the image I have from your test experience. The “FREAK” in this report is not the Raptor. Yes I replied twice. As James Bond said, “Once is not Enough” for some things!